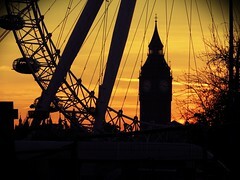 Sunset silhouette, a photo by thehutch on Flickr. There is something safe and secure about familiar things. They breed comfort, peace and can provide a sense of well being. However, we must be careful that we do not allow the familiar to prevent us exploring new things. In london we have all the favourite tourist destinations, the places that people want to see, be a part of and take pictures of. However, London is more than its famous landmarks, more than the well trodden paths, it has plenty of character, hidden spaces and beauty beyond compare that is often overlooked and forgotten. The same can be said of our lives, our families, our work places, our churches – when do we go exploring, get creative, plough new ground? We do not want to lose sight of the familiar and safe ground….nor should we lose sight of new possibilities and new horizons.